Another season with a below normal number of storms. There were only 8 named storms; 6 hurricanes and 2 major hurricanes. Of these only Bertha and Gonzalo had a direct impact on the Caribbean. Bermuda seemed to be a hurricane magnet, with two big storms in a row (Fay and major hurricane Gonzalo) going for it. The heart of the Caribbean Hurricane Network are the personal reports send in by the special hurricane correspondents on the islands. Find out whathappened on your favorite island during the 2014 Hurricane Season by following the links below. Following is an archive of all weather discussions Dave and I posted. They are in reverse chronological order, with the most recent storm discussion on top. If you want more background in formation on specific storms, I have found the 2014 Atlantic Hurricane Season section in the Wikipedia a great resource. Also, visit the Hurricane Research Division of NOAA's Atlantic Oceanographic and Meteorological Lab for 'best track' data of all 2014 storms. The track map below is from that website as well. Weather discussions by Gert & Dave during the 2014 Atlantic Hurricane Season. The homepage with the links to local reports from the islands, latest satellite image, current weather outlook can be found here. Monday, May 4, 2015 08:10AM EDT - Ana? It has been quite a while since my last post, for obvious reasons, and this one is a bit early as far as talking about a possible named storm 27 days before the official start of the 2015 Atlantic Hurricane Season. A disorganized low over Cuba will meander it's way across the Straits of Florida and into the Bahamas over the next few days and possibly stall out east of the Carolinas due to weak steering currents in the upper atmosphere. These same weak steering currents, in combination with unusually warm Atlantic coast waters for this time of year and its slow movement in the first place could enhance possible tropical development up to weak TS status. It could also develop into a hybrid system with some tropical and non tropical characteristics combined. Then again, if it doesn't close off the circulation, it will remain a potent low. Will it become the first named storm of the season, TS Ana? Good possibility. They will name it even if it is a hybrid system if the low closes off. Major effects of this system in all scenarios will be high wave action and subsequent beach erosion, street flooding in South Florida and the Bahamas cases, dangerous conditions for shipping and fisherman, and deadly rip currents all along the coast. Where will it go towards the end of the week? Will it get picked up by the jet stream and a front carries it away across the Atlantic towards Europe? Or not get picked up and wander west into the middle east coast states? Early season storms historically tend to hug closer to the coast so no surprise if it goes west. Preparation saves lives. Property can be replaced. You can't. Thursday, April 9, 2015 14:41PM PDT - Quiet season ahead!? It is that time of the year again for the traditional forecast of the upcoming hurricane season by Klotzbach&Gray at Colorado State University. Some good news, it is supposed to be a quiet season. They predict only 7 named storms (normal is 12) of which 3 will become a hurricane (6.5 is normal), one of those will grow into a major hurricane (Category 3 and up). The main reason for it is that it should be an El Niño year again and the relatively cold sea surface temperatures in the tropical Atlantic. Wednesday, October 29, 2014 17:38PM PDT - Thank you for donating! TS Hanna sure was a surprise when not a whole day had passed by after the NHC had given the system a 10% chance of development and voila! See, we are not as advanced as you think. Weather is an inexact science, has been and will continue to be. TS Hanna is located on the Honduran Nicaraguan border and should diminish as rapidly as she formed by Tuesday afternoon. Heavy rains and flooding with mudslides will be the biggest problems in Nicaragua while Honduras is in the midst of a severe drought and could use all the rain it can get although not as fast and heavy as Hanna is going to deliver it. Elsewhere the Atlantic Basin has a few weak waves trying to push westward and WNW and will bring rains over this week to the Eastern Caribbean. The primary culprit will be 95L, a few hundred miles off to the east of the Windward Islands. Most of the intensity models keep this below tropical storm strength and after passing through, upper level wind shear should prohibit it further thoughts at greatness. We could definitely use the rain. It does bring back thoughts of Gonzalo though. Models are showing another possibility in a few weeks in the SW Caribbean but too early to put any emphasis on that. Here in Central Florida, the drying continues with low humidities, cloudless days, cool nights and just overall beautiful weather and this will continue for the next 5 days with a spit possible on Friday. October surprise or not? Most people in the northern leeward islands like St.Maarten/St.Martin, Anguilla and St.Barts, were expecting a tropical storm, instead they got a strong Category 1 hurricane. Unfortunately most people were not prepared for this, and apparently one man lost his life on St.Maarten. As far as I know, two more are missing (one on St.Martin and one in St.Barts). For more read the reports by the special hurricane correspondents on the islands as they come in. Right now Gonzalo has strengthened to a Category 4 hurricane, with sustained winds near 130mph! This makes it the strongest Atlantic hurricane in three years... Looking at the Closest Point of Approach-calculator the eye of the storm is expected to pass just to the left of Bermuda (55 miles) in about 2 days (Friday, 2:00PM AST). At that time it will have weakened just a bit, but is still expected to be a major hurricane with 120mph winds! Fay was a wake up call for Bermuda, this will be the real thing, esp. if the track shifts just a bit to the east. I know they aren't saying it yet but I am: Gonzalo is a Cat 1 hurricane. Storm centered 17°32'N, 62°21'W, 30 miles ENE of Basseterre, Saint Kitts and Nevis with a 20 nautical mile eye. Surface level winds at 73.6 mph and are expected to strengthen even with a little dry air around as wind shear is light and SST's are nicely warm. Flight level winds were clocked at a maximum of 82.9 mph as of the flight level time less than an hour ago. More later. Have to reinforce the towel brigade! Good morning all and hello to TS Gonzalo! While the official word is not out yet, I would find it hard to believe that we do not have TS Gonzalo right now, currently located about 230 miles east of the Lesser Antilles. I believe at the 11 am advisory TS watches and warnings will be posted due to this systems close proximity to the islands, forecast track, and limited time available left before impact. Hurricane Hunters will investigate this afternoon but by then the time frame will be even more limited so the NHC should pull the trigger on this soon. Only reason it might not is conclusive evidence a low level circulation has not formed or closed off but common sense dictates otherwise and time is of the essence especially for the boating community. A trough is expected to protect the mainland US from a strike from soon to be named Gonzalo but the Bahamas, Turks & Caicos, PR and the DR should be watching closely as hurricane status is a good possibility down the road Tuesday through the end of the week. Bermuda, already and currently dealing with rapidly passing TS Fay, will probably be enlightened by Gonzalo as well chasing Fays skirt tails. A flash flood watch has been issued for the northern islands and it remains to be seen just what will be on our doorstep designation wise tomorrow. Doesn't matter what it is designated though as heavy rains, angry seas, water spouts, flooding and "scattered" power outages are an almost definite. Off to the east we also have another contender to an otherwise meager Atlantic tropical throne, 91L but it appears to have lost some of its luster for the time being. More later as we get some conclusive information from the Hurricane Hunters. Me? Time to activate the towel brigade which has been well rested this year but is still battle tested. It has been awhile since I posted, a good thing! A tropical storm watch has been issued for Bermuda because of Fay. The Closest Point of Approach-tool says that the center will get as close as about 70 miles to the east of Bermuda, well within tropical storm force wind range. Also most of the advection is on the Bermuda side, so they will experience some stormy weather. But knowing Bermuda, they can absorb it easily! There are also two invests out there. Number 90L could become Gonzalo in the next day or so and is expected to skirt just north or over the northern islands as soon as tomorrow. We definitely have to keep an eye on this one, since it might become a hurricane at some point. Regardless, heavy rains in store for the northern Leeward Islands. Use the tools above to see how the storms can affect you! Sunday, October 5, 2014 08:34AM EDT - Quiet but? With the Pacific region getting all sorts of unwanted attention in all tropical quadrants, the Atlantic side has been bereft of any attention in the tropical cyclone formation arena with the exception of a few dubious "L"s, mainly designated to probably keep everyone at the NHC from yawning and to keep complacency, a virile enemy, from becoming entrenched. Starting off to the east on the African continent, there is only one wave of any real relativity and that one hasn't even made it halfway across yet. Most of the continent is pretty dormant. On the west coast itself, there is a low latitude wave getting ready to splash and dash but the stability of the atmosphere and the continued presence of unusually late in the season Saharan dust will put a "damper" on potential development. Mid Atlantic lots of moisture spread out between 5-15 degrees N and 45 degrees W but it is enveloped in the ITCZ and looks to be a rainmaker for the southern Windward Islands who really don't need more rain with some parts of T&T flooding and should shunt some of that rain up here to the north. "hint hint"
Locally it has been hot (hi temp supposed to be 82 and its already 84 at 8 am), unusually dusty and hazy, and rain drops have been sporadic at best. Forecast looks for some moisture to move in next week but nothing organized or remotely significant with wind shear, in conjunction with the dust, remaining mortal enemies of convection. Down the road the area to watch will be the SW Caribbean as conditions have ripened as is normal for this time of year. While the CV or Cape Verde season has been declared DOA, the possibilities of storm formation have gradually increased in the deep Caribbean and could be aided by some flow from the East Pacific. Will there be a hurricane on Florida's doorstep around October 15th? Some of the more reliable models (and I temper that word reliable) forecast just that. With their record here in the Atlantic this season being dubious at best, many people will not give any attention unless something just blows up and heads there way. We still have 7 weeks left in the official season. For those in the Caribbean and the Gulf, now is not the time to forget that. Continue being aware and prepared. Returning from a week in the beautiful country of Costa Rica with very limited access to media on the Pacific side hoping nothing was going on tropics wise I see I haven't missed much until the last day or two. 92L will be a drencher for mid to south Florida and the northern/central Bahamas and has a scheduled date with Gulf of Mexico. This date may give some along the gulfcoast a very big headache in the days to come but development is not expected to be rapid even though there is plenty of energy available in the form of very warm and unmolested STT's. Models are all over the place as it is a weak system but we will see what happens after the peninsula crossing.If you are in the gulf, you need to monitor this system as it will be like a caged animal. It has no where to go but hit land somewhere. TD#6 should eventually reach Cat 1 status by the time it reaches the cooler waters of the north central Atlantic and is not expected to be a threat to any Caribbean of US land masses at this time. Looking at the satellite images it's environment is fairly moist and wind shear manageable for development. Already above 16 degrees north, Edouard, as it will knighted, is resigned to becoming a "fish storm". More over the next few days. Time to catch a plane! Saturday, August 30, 2014 10:29AM EDT - Next! What once was Invest 97L has now been relabeled Invest 99L and is south of Jamaica moving off to the WNW on a collision course with the Yucatan Peninsula of Mexico, the Bay of Campeche in the SW Gulf of Mexico and ultimately as a probable low to mid tropical storm with the northern Mexico, southern Texas coast. Hopefully, the system will bring beneficial rains to those areas and not much flooding although the ex invest 98L remnants are drenching these same areas and points north into Galveston, Houston and even Louisiana but not reaching too far inland where it is sorely needed. Cristobal, ex hurricane and now extra tropical whose long life has been spent mainly threatening shipping interests is now racing towards his date with Lady Iceland at about 45 mph. Still packing a punch as most of these extra tropical storms do after the transition from tropical to extra tropical Cristobal will probably give Europe a good jolt as well. Down south by Trinidad and Tobago we have a wave moving through with no chances of development but squally winds and rains will be prevalent and the rain is needed. Out in the central Atlantic it appears a wave around 45 degrees west is making a case for Invest status and I believe it should be classified by now and should be soon. Moving mainly west about 15 mph, the bulk of the increased thunderstorm activity is actually around a cluster at 36 degrees west, 12 north. Upper level winds are moderate and the majority of dry Saharan dust is to it's north so some slow growth is possible although the NHC only gives it a 10% chance by Wednesday. If it stays far south then I agree with that but if it starts a shift more WNW then I see an improved chance for some development. We seem to be the "birthing grounds" for storm this year with Bertha and Cristobal already hatched. The African mainland has another impressive wave with its exit strategy coming to fruition in about three days or so. It is the heart of hurricane season and we should expect nothing less. Be prepared. You never know. The Invest was upgraded to tropical storm Cristobal over the weekend. It should stay nicely off the US coast on its way north/northeast. However, it is expected to become a hurricane in 48 hours or so, but no threat to land. There is also another invest about 1200 miles off the islands, but it doesn't look that it will develop into anything, we'll see. Friday, August 22, 2014 15:46PM EDT - 96L Trend? While lashing many of the Windward and Leeward Islands with beneficial rains and some gusty winds, 96L has appeared to imitate Bertha a few weeks ago as a discombobulated system. Stretched out over a few thousand miles from tip to tail, it is hard to conceive when exactly will it consolidate and become a name aka Cristobal. Currently, the COC (center of circulation) of the low is 100+ miles WNW of Puerto Rico although another COC appears to be trying to form south of Puerto Rico at the same time. Consolidation of these two would be definitely hindered by the mountainous terrain of Puerto Rico and the island of Hispaniola which comprises Haiti and the Dominican Republic. (By the way I hate when Jim Cantore says the Dominican. Jim, the country has a name; Dominican Republic). I respect and admire the man otherwise. The effects of this far ranging system are still being felt from south of Barbados up to the easternmost part of the Turks and Caicos. Hello??? Can you say WOW??? Yes, even though not a "named" tropical entity yet, it is a force and will continue to be for the next few days along the Windwards and Leewards. Current model forecast and general meteorological thinking has the system finally being designated Cristobal by tomorrow afternoon and quite possibly a hurricane not long after given the lack of strong wind shear and very warm SSTs in the Bahamas. Banding is already starting to manifest itself but its proximity to the DR mountains could hinder its southside development temporarily. Track forecast right now is iffy. Hurricane Hunters are scheduled to fly late this afternoon and give us some serious updated data. A strike on Florida and/or somewhere up the coast is not out of the question but most models tend towards a trough picking up a stronger system and shoving it out to sea. Remember, weather is an inexact science still and Mother Nature does not always adhere to a human forecast. Devils advocate. Bottom line is to be prepared whether your in the Bahamas, T&C (already), and the east coast. Hurricane Hunters found a closed surface level circulation but not the requisite organized thunderstorm activity so the NHC is holding off on upgrading to a depression. While there are many uncertainties concerning 96L, one thing is certain: due to it's elongated presence, the copious distribution of largesse (means gifts) to the majority of the Windward and Leeward Islands in the form of beneficial rains will occur, hopefully more than Bertha. 96L is currently being steered by strong high pressure spanning the expanse of the central Atlantic and is moving generally west to west northwest at about 12 mph. Traveling much slower than Bertha those beneficial rains could also be flood threats so I see flash flood advisories going up as early as tonight. In addition gusty winds and cloud to ground lightning will occur especially during accompanying thunderstorms. Not forecast to intensify rapidly there are a few factors to consider that favor slow intensification as it approaches. Wind shear has dropped to a low moderate level, SST's are now in a positive temperature range for fueling the systems engine and dry air has diminished as the air has moistened considerably around it. We could see it reach depression status tonight or tomorrow and maybe even a Cristobal. Hurricane Hunters are scheduled to visit 96L this afternoon and we will have a better handle on 96L once the data starts to stream back. After this system passes it remains to be seen where it could venture. The one scenario most models favor is a trek across Hispaniola and being turned northwards by a trough digging down weakening the highs influence. Another scenario, not impossible but improbable, is it continues moving more westerly due to being a weak system and head towards the western Caribbean. The last one is one that will all depend on timing: If the trough doesn't pick 96L up, then we potentially could have a Florida landfall as a hurricane as those very warm Gulfstream waters and weak wind shear currents will allow 96L to fester rapidly while the high resumes its influence and steers it into Florida. Let's hope for the first scenario to play out. Despite the draconian grip of copious amounts of Saharan Dust across the hurricane bowling alley of the Atlantic, we have a tropical wave with a 1011 mb low located at 11N 40W showing signs of defiance with a juicy flareup of showers and thunderstorms. Facing more hostility the next few days as it treks mainly west at 10 mph, in the form of marginal SST's (sea surface temperatures) aka fuel, a dry stable and not very moist atmosphere and a bit of wind shear, this wave definitely has some issues to contend with but if it survives the next two days, it's outlook may become more pronounced and we may have a Cristobal. Why? SST's (see above) will be warmer so the fuel for the fledgling engine will be hot and available while wind shear remains marginal. Pesky but fractured, the Saharan Dust level will still do its best inhibiting dance but will not be as forceful. Behind this low is several more waves ready to exit stage left the African coast and, as we enter the "hot zone time period" of tropical development, our awareness should be heightened. The time for blobbette formation is at hand. Thursday, August 14, 2014 13:59PM EDT - Quiet but for how long? Two hurricanes and that's the tally so far in this so far quiet as predicted 2014 Atlantic season with the heart of season starting tomorrow and lasting to mid October. The desert dry Saharan dust layer has been stifling any development so far and will continue its predation on tropical waves exiting the African coast much like seagulls waiting for baby turtles to hatch and race for the relative safety of the water. Currently, decent area of dust envelopes the Lesser Antilles but is not as strong and dense as previously last month and will be followed by a moister patch of air and the remnants of 94L. Another denser batch will follow the passage of ex-94L and then we have another baby hatchling of a wave which is not forecast to grow up either. However, this one is low latitude and if it survives its trek as even a decent wave across the Atlantic, it could make a mature presence down the road. Behind this wave at 31W with a 1012 low attached is a newly hatched wave with some vigor. As these other waves ahead transverse the hostile environment ahead, they could moisten up the atmosphere enough to allow for some slow development. SST's are marginal (hey look at Julio in the Pacific where he was surviving 25.3 C degree ( that's about 77.5 F) water temps as a TS still) so not out of the question for slow development. Wind shear is modest as well. On the African continent itself there looks to be a lull in marching orders for a few days and then a couple of waves fall off in fairly quick succession and as we approach the end of August into September, this is where the fur might start to fly a little. As usual time and Mother nature will tell. Closer to home we sure could use some more rain. Bertha was a bust for most here in the VI while water trucks continue to ply their trade as prolifically as the taxis do. Hopefully it rains before and after the Chili Cookoff on Sunday! Sunday, August 10, 2014 14:57PM PDT - New Invest and no El Nino? There is a new area of disturbed weather, close to the Cape Verde Islands, so far away from us. It looks like it might become something, so we have to keep a close eye on it, esp. since the models don't show it curving too much to the north. Quick update as I was supposed to be in St. Croix at 9:15 am but flight cancelled and new flight is supposed to be 2:30 pm. Heavy rain is falling all over the Virgin Islands right now and winds are around 28 mph from the SE gusting to 35 mph with accompanying thunder and lightning. Fortunately, WAPA is still on (probably jinxed it!) and the towel brigade is deployed and operational. On the way back from the airport, the usual suspect areas were starting to flood and I expect all sorts of earthly runoff to flow into the sea and also down our mountain roads. TS Bertha is moving rapidly but beneficial rains are falling; not only here in the Virgin Islands but mid southern Puerto Rico as well where severe drought conditions exist. Flood warnings are already up in some counties and cities with shallow rivers and streams. Due to her forward speed, conditions will rapidly improve overnight and tomorrow should be a dry beautiful day here but Hispaniola, the T&C and the southern Bahamas are up next to bat and Bertha could intensify as she motors on her trek. Just a quick update on the now hard charging Bertha, about 70 miles NE of Barbados moving WNW at 21 mph. Bertha is a fighter having made the upgrade to TS status last night but having a hard time keeping her top on! Westerly wind shear is playing havoc with the west side of the system and an exposed COC (center of circulation) is very evident; almost way out in front of the convection which some of it is. HH found 50 mph sustained winds but not much further strengthening is forecast due to the relentless shear. At least not in the near term. Most of the convection and sustained wind action is in the North and East quadrants which means the NE Antilles should reap beneficial rains but at a cost of flooding. The middle Windwards will get a smack from Bertha and then she enters the Caribbean with a bit warmer SSTs so it wouldn't surprise me if she made 60 mph eventually. Using the extrapolation tool provided by Gert, the center is expected to pass about 64 miles at its closest approach to St. Croix and less than 100 miles from St. Thomas. The TS force winds stretch out 115 miles so Virgin Islanders, do the math. I actually think it will get a little closer as it has shifted a few degrees over the last few hours. I'll have more on what to look for down the road but Hispaniola and Puerto Rico should receive good rains too, more so Puerto Rico. Then T&C and the Bahamas, if she survives, should be very ready. That Gulf Stream is very warm. 93L is still lumbering along the Atlantic bowling alley approximately 625 miles east of the Windward Islands moving a not so consistent W to WNW. It has not consistently started to move WNW yet and if it doesn't start to by noon, then it will probably pass farther south than forecast. The ridge off to the west is not helping 93L turn nor is the fact it hasn't significantly strengthened yet. Sometime today 93L should be upgraded to TD status. I was looking at the 11 am or even 2pm advisory at the latest for the upgrade but the NHC might wait until Air Force recon (Hurricane Hunters) flies in this afternoon. Thunderstorms and shower activity have increased and a middle level circulation is indicated while a satellite pass over earlier revealed 30-35 mph winds north of the center. Its all looking like a 45-55 mph tropical storm in a few days with heavy rains over a 5-7 hour period of 3-7 inches over the NE islands from Antigua to the BVIs and USVI and the eastern half of Puerto Rico with El Yunque wringing out up to 10 inches! Only IF it turns as anticipated. If not, the southerly track will be the alternative. Regardless you might want to take your awnings down and stow your light deck furniture as these become flying missiles. Take care of your pets and check on those less able to help themselves. Boaters, we all know how things can turn nasty quickly so judge accordingly. Tomorrow afternoon, ahead of the storm will be the usual sinking air (subsidence) that appears as a storm approaches. We'll know a lot more about the track and intensity by then. I am back, just in time, from my trek to the UK for my nieces wedding and time in Florida for the probable arrival of Bertha. Now spinning pretty decently around 10N 40W and moving mainly west at 10-15 mph, it remains to be seen just in what form Bertha will knock on our door here in the NE Caribbean. Will she arrive as a hurricane, tropical storm, tropical depression, or a bust imitator of TD#2? The reliable models mainly are on the TS bandwagon. Intensity models have a hurricane within 3 days after reaching TD status. There are factors for and against and as usual, since the storm is not organized, the models have a rough time in their forecasts. The now factors are dry Saharan Dust infiltration from the north, elevated wind shear, and cooler SSTs Sea Surface Temperatures) which we know is the fuel any tropical system needs in the first place to develop. They are around 80.6 degrees in the area which is marginal. This plus the above factors are why the thunderstorm activity has decreased. One other factor to take into account is its proximity to the ITCZ. If it doesn't break away from that, it will not genesis.Still, with all these issues, it looks pretty healthy, especially on visible animated satellite imagery. The future factors are a moister environment ahead, much lower wind shear, warmer SSTs and the earths spin which should help 93L break away from the draconian grip of the ITCZ. This should lead to development as a named system (TS Bertha) by Friday. The slower it takes for cyclogenesis to occur, the further south it stays moving mainly west. If it does strengthen, then it will start to take a NW component and there currently are no forecast troughs or high pressure ridges to keep it flatlined. Around here in the Virgin Islands and the rest of the NE Caribbean the drought is reaching severe. June 2014 was the driest month ever since records have been kept. Sure, some parts of the islands have seen some rain but nothing widespread or lengthy. Water trucks are rampant and it seems they are competing with the already too many taxis for available road space! I'm sure July will compete with June. Will 93L (at the moment) be a drought buster? Many are hoping this is manifest so. One problem with that is too much rain at once on parched ground which will not be able soak it up as fast as it falls leading to flash flooding and coral killing runoff. Either way time will tell. Things should heat up in the month of August and preparations should start now if not already in motion. There is a new area of disturbed weather, referred to as Invest 93L. It is in the far eastern Atlantic and pretty far south, so it will take a few days before it reaches the islands. Unlike our last depression this one has a high chance of becoming a hurricane. It is still too early to tell if the storm (Bertha by then) will curve north before it reaches the islands. So stay tune! It has been a while since my last post with not much action to ponder which really is a good position for all of us to be in but I believe a quiet start does not mean a quiet season ahead for us here in the Atlantic Basin. Already in the Pacific we have seen 4 named storms form; the latest being TS Douglas yesterday. None have had a destructive impact on land and as long as that trend continues it will be a good season no matter how many form. If a couple of them meandered farther north and sent some rain into Southern California, the Southwest and Texas, those beneficial rains could help alleviate the serious drought being experienced in those areas; also a good season. Here in the Atlantic, we have experienced a big 0 in the amount of named storms (a very good thing) and only one decent area of interest, now labeled 91L, currently located between the east coast of Northern Florida and the Northern Bahamas. Wind shear is low and the gulf stream temperatures are plenty warm enough to get this thing jumpstarted but some dry air from the north has been an inhibiting factor. Nonetheless, it looks like we will have our first tropical depression forming in that area within the next 48-72 hours if not sooner. If it reaches TS status, the first name on the list is Arthur. The models cannot agree yet on a possible track with some over Florida and some up the NE coast as they always have difficulty when a system is not organized. Regardless, heavy rains are probable from Florida up to Virginia and the central/northern Bahamas depending on how far south it goes first. Time will tell. Off to the east the Saharan Dust level is enormous stretching from Hispaniola to Africa. This, along with high westerly winds, aka wind shear, will continue to suppress tropical formation in the Atlantic bowling alley for the time being. As Gert mentioned previously, El Nino could turn into El Wimpo making for an interesting September/October. Closer to home, rain is the four letter word most people are talking about here in the Virgin Islands with "lack of" being the prominent phrase most used before it. This has been the driest mid may to the end of June I can recall in the 24 years I have lived here. Normally, mid February and March are very dry but this has been drought like. A tropical wave with most of its energy is passing south of our islands but looks like it will throw us a bone or two later today while St. Croix, closer to the action has seen a much prayed for downpour already with another blast coming shortly. It's possible this creeps up north far enough we may get something decent out of it before a return to the dust induced haze and filtered sunshine. And here we go again! Atlantic Hurricane Season officially started yesterday! Most seasonal forecasts call for a below to normal season because of a possible El Niño forming. Kltzbach and Gray predict 10 named storms, 4 hurricanes of which one will be a Category 3 or higher. Normal is 12, 6 and 3 respectively. The probability of at least one major hurricane travelling somewhere through the Caribbean is 32% (normal is 42%). 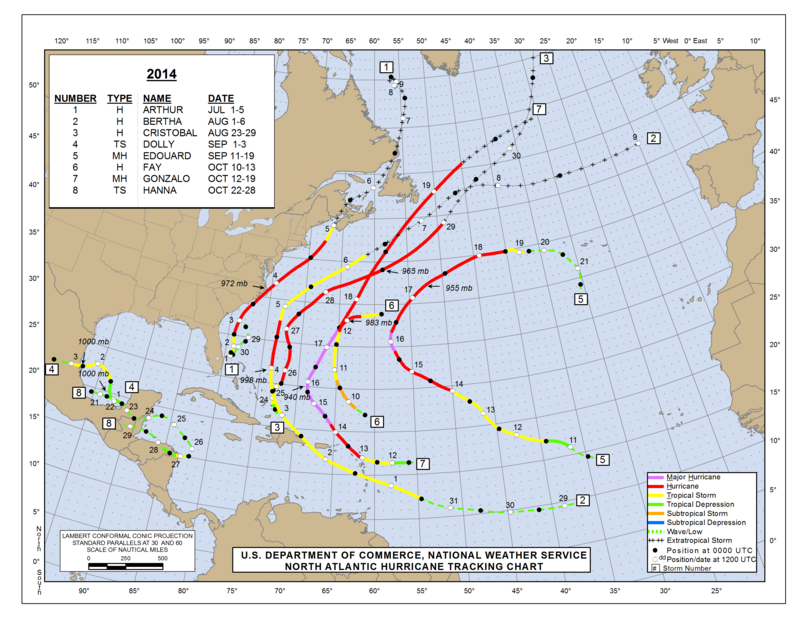 NOAA predicts 8-13 named storms, 3-6 hurricanes (1-2 major). There is a 50% chance of a below-normal season, 40% near normal, and only a 10 percent for an above-normal season. Finally, Tropical Storm Risk predicts 12 tropical storms, 5 hurricanes and 2 major hurricanes. A few familiar ones (at least names I remember from previous years), like Bertha (1996). Wow, I have been doing this for that long... this makes it year 19, before Google even existed or blogging was a word. That reminds me, as you probably know, I depend on your donations to keep the website going. It is not cheap to have such a high traffic website, hosted on two dedicated servers. So if you can, please donate. Anything helps! Finally, there are some changes to the National Hurricane Center Forecasts. Most notable will be that the advisories are not in ALL CAPS anymore, so no more yelling :-). There will also be a new graphical tropical weather outlook showing areas of potential development for the next 5 days (there is already a 48 hour graphical outlook, see below). See more here. Hi all! Sorry for being absent, I have just been very busy with work and other things. But now I am back!!! I should be 'home' for almost the whole season, but I will participate in a month-long research cruise from mid-August to mid-September, pretty much peak season. But hopefully I will have some kind of live internet on-board. In any case, I just made the website ready for the 2014 Atlantic Hurricane Season! For this I always have to move a lot of files around, and hopefully I didn't break anything... What will 2014 bring us? Another one like last year would be great! And we might actually get an other slow season since all signs point to an El Nino developing later this year, which normally dampens hurricane formation. Renowned hurricane forecasters at Colorado State, Klotzbach and Gray, indeed forecast a below average season with 9 named storms (12 is normal, last year we had 13) of which 3 become a hurricane (6.5 is average, last year we had none!) and 1 major one (2 is normal). They state that the probability for at least 1 major hurricane moving through the Caribbean is 28% (42% is average for the last 100 years). So not too bad! Friday, May 2, 2014 13:42PM EDT - New season! Good afternoon from Carnival St. Thomas! The official start of the 2014 Atlantic Hurricane season is just a mere 29 days away and forecasters, in their early predictions, have forecast a rather sublime season with average 9 named storms, 3 hurricanes and one major hurricane. The main reasons are a strong El Nino is expected to form in the Pacific and cooler SST (sea surface temps) in the Atlantic. The Eastern Pacific season officially starts May 15th and when El Nino forms, the Pacific side traditionally is more active as the waters warm up in that area. Nothing definitive is set yet though. With these predictions comes a fear of complacency; not that it doesn't exist when above average seasons are forecast but obviously more prevalent when lesser than average storm seasons are predicted. However, as I stress every year, you can have 50 storms or 1 storm. If that one storm lands in your backyard, its a bad year! As always, preparations are a must as in supplies, evacuation plans for you, your family and even elderly neighbors who need help, and landscaping in terms of removing anything that can be turned into a flying missile. That's it for now. Happy Carnival St. Thomas!